For me this record is all about Stay The Night. Sultry and effective. Great record. Sounds very similar to a lot of the "lofi" house stuff coming out lately. Every track is a winner. Unfortunately we have been informed that this release is actually an illegal bootleg release which was not licensed from the copyright holders, thus meaning we will not be getting any, sorry. hmm got an email from redeye for my preorder on this repress ??? anyone the same too? 'Wind on Water' contains samples from a rare documentary by Diane Keaton called Heaven. Cool track! This EP by the Scottish Deep House act was deeper than deep and certainly helped to establish Guidance Recordings from near downtown Chicago as a force to be reckoned with along with the mega-popular Blue Boy record that came out around the same time. While the record is probably best known for "Wind On Water" the quality level remains high throughout and furthermore this record seems to have stood the test of time particularly well and sounds much better than most of its deep house contemporaries. 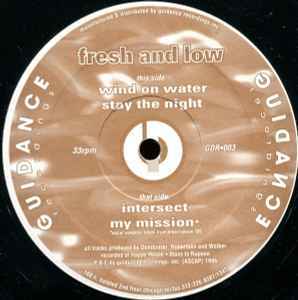 Fresh And Low would continue to release many records over the years on this and other labels under this and other names, but this release remains by far their best in my opinion.